Historian Michael O’Malley from Berry College will present the amazing story, “Exploring Martha Berry’s Connection with Lookout Mountain and Her Legacy at the Berry School’. Martha Berry was an American educator and the founder of Berry College in nearby Rome, Georgia. Martha Berry once had a summer home in Mentone and she worked to preserve the area that became DeSoto State Park and Little River Canyon National Preserve. Her nephew Frank Berry worked in the CCC camp at Fort Payne on the project that became DeSoto State Park. Fee:$5.00 per child for supplies; pre-registration required by the Wednesday before the program date. Space is limited. Call 256.782.5697 or email for details. Orbix Hot Glass is a glass blowing studio and gallery on Lookout Mountain that offers fine decorative and functional glass, as well as very popular glass blowing classes. Have you ever wanted to actually sit at the gaffer bench and feel what it is like to shape hot glass? In this class, it’s all about a hands-on experience in a safe and fun atmosphere with a final product we know you will love. After watching us shape glass into a flower, it's your turn to sit at the bench to a sculpt your own from an array of colors. Our artists are the to step in and lend a hand or guide you as you shape the glass. Check out even more classes and info at www.orbixhotglass.com Classes have a minimum of 3 people and a maximum of 5. Class is about an hour in length. Local art, local music, local fun! Mentone Area Arts Council will be sponsoring the Second Saturday Art Market. It will be located in the vacant lot on the South side of AL Highway 117, across from the Mentone Market. Fee: Free & open to everyone. Come out and support local artists! Little River Canyon is holding a butterfly blitz to discover how many species of beautiful and interesting butterflies we have here. Little River Canyon National Preserve has never had an official butterfly study. We would like to get pictures of each species of butterfly encountered if possible. Bring a camera and magnifying glass for this family-oriented field trip day. Moderate walk, day pack with water, snacks, bug repellent, sunscreen, and suitable clothing and closed-toed shoes are recommended. Listen, Look and Learn programs held at the Canyon Center most Saturdays at JSU’s Little River Canyon Center. See Little River Canyon Center on facebook.com to see the schedule for 2015! Fee: Free & open to the public, great for all ages! Call 256.845.3548 for details. Join Robert Wilson from Seven Pines Survival in this basic survival trapping class you will learn how to make a few common traps that are found in many survival manuals. You will get a chance to make these traps yourself. There will be a knife safety course along with this class. Supplies limited; IF possible bring a fixed blade knife. Fee: Free. Ages 10 to adult; minors to be accompanied by an adult. Join lepidopterist and photographer, Vitaly Charny, co-author of 'Butterflies of Alabama' to learn about the many species of butterflies in the great state of Alabama. Seating is limited, so bring your own comfortable camp chair if you wish. Join Vitaly Charney to learn about Butterflies of Alabama and see beautiful photos. Locally & nationally-known craftsman Jim Marbutt will demonstrate this interesting artform of usefulness & beauty. See wood pieces become works of art using a chainsaw and hand-tools to carve animals and people. Call 256.997.5025 or email for more details. 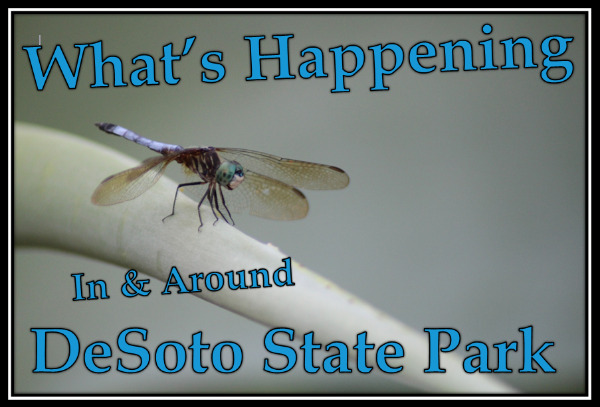 Join lepidopterist and photographer, Vitaly Charny, to learn more about the fascinating life-cycle of Alabama’s Dragonflies and Damselflies. Stunning photographs to see! The Boom Days Heritage Celebration, Fort Payne’s annual art and music festival, displays citizens of Fort Payne taking a second look at their past and the heritage passed down to them through the arts and crafts of our area. It features dozens of the South’s finest visual artists and traditional craftsmen, as well as dozens of the area’s most talented musical groups. Four blocks of the city’s downtown district are closed to traffic while art shows occupy Alabama Park and City Park, and a variety of music flows from four outdoor stages. Downtown merchants operate sidewalk sales, and cultural and historical displays are mounted at the Fort Payne Culture & Heritage Center and the Depot Museum. Join us for a fun campfire talk in the Great Outdoors! Do you want to learn more about Geocaching? Geocaching is a real-world, outdoor treasure hunting game using GPS-enabled devices. Participants navigate to a specific set of GPS coordinates and then attempt to find the geocache (container) hidden at that location. This campfire talk will include a lesson on what geocaching is and how you do it. There will be a live demonstration of geocaching and geocaching supplies will be on display. Fee: Free & open to the Public & Great for all ages! Call 256. 997.5025 or email for details. Orbix Hot Glass is a glass blowing studio and gallery on Lookout Mountain that offers fine decorative and functional glass, as well as very popular glass blowing classes. This class is designed for those who really just want see what molten glass is all about - feel the heat, gather from the furnace, sculpt the glass into you own design. It is ultimately about the experience, some experimentation and a couple nice paperweights to take home or to the office to show your friends. Custom reservations can be made for groups anytime. Call 256.523.3188 or email for details. Join National Park Service and volunteers for a park clean up/trail work day. Let's celebrate National Public Lands Day by coming out to help us clean up the canyon! Come one, come all, but wear sturdy shoes, put on your work gloves, and pack a lunch and let's take pride in a place we all love. Signup will start at 10:00 at the Little River Canyon Center. We will provide bags, nitrile gloves, water and snacks. Bring a friend or the family and come enjoy the day hiking and feel good about the fact that you are helping to clean up the park. The art of coiling baskets is universally common to indigenous peoples. Coiling is the technique of creating baskets and art from pine needles and was a part of pre-Columbian Native American crafts. Today, pine needle baskets and art are made primarily for decorative purposes. All materials (pine needles, thread, and small center for basket) will be furnished. Class is for ages 12 and up.